For other ships with the same name, see USS Vincennes. 19th-century painting (based on a sketch by Lieutenant Charles Wilkes, USN), depicting USS Vincennes in Disappointment Bay, Antarctica, circa January–February 1840. Namesake: A city in Knox County, Indiana, on the Wabash River, 45 miles north of Evansville, Indiana, which was the site of American Revolution battles. USS Vincennes (1826) was a 703-ton Boston-class sloop of war in the United States Navy from 1826 to 1865. During her service, Vincennes patrolled the Pacific, explored the Antarctic, and blockaded the Confederate Gulf coast in the Civil War. Named for the Revolutionary War Battle of Vincennes, she was the first U.S. warship to circumnavigate the globe. Vincennes—the first American ship to be so named—was one of ten sloops of war whose construction was authorized by Congress on 3 March 1825. She was laid down at New York in 1825, launched on 27 April 1826, and commissioned on 27 August 1826, with Master Commandant William Compton Bolton in command. The ship set sail for the first time on 3 September 1826, from New York bound for the Pacific by way of Cape Horn. She cruised extensively in that ocean, visiting the Hawaiian islands in 1829 and made her way to Macau by 1830, under Commander William B. Finch. :pp.208–9 Her return voyage was made by way of China, the Philippines, the Indian Ocean, and the Cape of Good Hope. Ship chaplain Charles Samuel Stewart published a book about the voyage. After nearly four years, Vincennes arrived back in New York on 8 June 1830, becoming the first U.S. Navy ship to circumnavigate the Earth. Two days later the ship was decommissioned. Following repairs and recommissioned, Vincennes then operated in the West Indies and the Gulf of Mexico as part of the West Indies Squadron in 1831–32. After a long bout of yellow fever, she was decommissioned again for a time in 1833 before sailing once more. She departed for a second Pacific deployment in 1833, becoming the first American warship to call at Guam. She again sailed around the globe to return to the U.S. East Coast in June 1836. Decommissioned once again in 1836, while she underwent remodeling, she was refitted with a light spar deck and declared the flagship of the South Sea Surveying and Exploring Expedition to the Antarctic region. 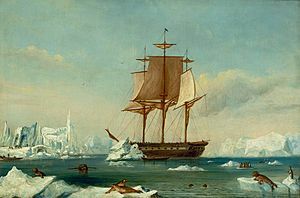 Commanded by Lieutenant Charles Wilkes, the expedition sailed from Hampton Roads in August 1838, and made surveys along the South American coast before making a brief survey of Antarctica in early 1839. Entering into the South Pacific in August and September 1839, her cartographers drafted charts of that area that are still used today. Following survey operations and other scientific work along the west coast of South America and in the South Pacific during the rest of the year, in late 1839 Vincennes arrived at Sydney, Australia, her base for a pioneering cruise to Antarctica. She un-intentionally exposed the lack of defences and security at Sydney Harbour when she slipped un-noticed into Sydney Harbour on 30 November 1839 under the cover of darkness. Between mid-January and mid-February 1840, she operated along the icy coast of the southernmost continent. The coast along which the ship sailed is today known as Wilkes Land, a name given on maps as early as 1841. The remainder of her deployment included visits to the islands of the South Pacific, Hawaii, the Columbia River area, Puget Sound, California, Wake Island, the Philippines and South Africa. This third voyage around the world ended at New York in June 1842. Vincennes was next assigned to the Home Squadron and placed under the command of Commander Franklin Buchanan, a distinguished officer destined to become the first Superintendent of the United States Naval Academy. She sailed to the West Indies and cruised off the Mexican coast until the summer of 1844. Though this duty proved relatively uneventful, Vincennes did rescue two grounded English brigs off the coast of Texas and received the thanks of the British government for this service. Buchanan was also ordered to prevent any attempted invasion by Mexico of the new Republic of Texas. This eventuality never materialized; and Vincennes returned to Hampton Roads on 15 August to enter dry dock. On 4 June 1845, Vincennes sailed for the Far East under command of Captain Hiram Paulding. She was accompanied by the ship-of-the-line Columbus, under the command of Captain Thomas Wyman; and the two vessels formed a little squadron under the command of Commodore James Biddle, who carried a letter from Secretary of State John C. Calhoun to Caleb Cushing, American commissioner in China, authorizing Cushing to make the first official contact with the Japanese Government. The Vincennes and Columbus in Japan. The squadron sailed for Macau by way of Rio de Janeiro and the Cape of Good Hope. Commodore Biddle arrived safely in Macau only to find that Cushing had already left for home and that his successor, Alexander H. Everett, was too ill to make the trip. Therefore, Biddle determined to conduct the negotiations himself. Accordingly, Vincennes and Columbus sailed for Japan on 7 July 1846 and anchored off Uraga on 19 July. The Japanese surrounded the vessels and allowed no one to land. Otherwise the visitors were treated with courtesy. However, Commodore Biddle's attempts to force the opening of feudal Japan to multinational trade were politely rebuffed, and the vessels weighed anchor on 29 July. Columbus returned to the United States by way of Cape Horn, but Vincennes remained on the China Station for another year before returning to New York on 1 April 1847. Here, she was decommissioned on the 9th, dry-docked, and laid up. Vincennes remained in ordinary until 1849. Recommissioned on 12 November 1849, she sailed from New York exactly one month later, bound for Cape Horn and the west coast of South America. On 2 July 1850, while lying off Guayaquil, Ecuador, she harbored the Ecuadoran revolutionary General Elizalde for three days during one of that country's frequent civil disturbances. Sailing on to San Francisco, California, the vessel lost 36 members of her crew to the gold fever sweeping California at the time. Turning south, Vincennes cruised off South America until late 1851, closely monitoring the activities of revolutionaries ashore. She made a courtesy call to the Hawaiian Islands at the end of the year and proceeded thence to Puget Sound where she arrived on 2 February 1852. She anchored briefly there and returned via San Francisco and the Horn to New York where she arrived on 21 September and was decommissioned on the 24th. Following repairs and a period in ordinary, Vincennes was recommissioned on 21 March 1853 and sailed into Norfolk, Virginia on 13 May to join her second exploratory expedition, serving as flagship to Commander Cadwalader Ringgold's survey of the China Sea, the North Pacific, and the Bering Strait. Comdr. Ringgold was a veteran of the Wilkes expedition. The squadron stood out of Norfolk on 11 June 1853, rounded the Cape of Good Hope, and charted numerous islands and shoals in the Indian Ocean before arriving in China in March 1854. Here Commodore Matthew Calbraith Perry relieved Ringgold for medical reasons and gave command of the expedition to Lt. John Rodgers. Vincennes sailed on to survey the Bonin and Ladrone Islands and returned to Hong Kong in February 1855. The expedition sailed again in March and surveyed the islands between the Ryūkyū chain and Japan, and then the Kurils. Vincennes left the squadron at Petropavlovsk, Russia, and entered the Bering Strait, sailing through to the northwest towards Wrangel Island. Ice barriers prevented the vessel from reaching this destination, but she came closer than any other previous ship. Vincennes returned to San Francisco in early October and later sailed for the Horn and New York, where she arrived on 13 July 1856 to complete yet another circumnavigation of the globe. Vincennes operated with the African Squadron in 1857–1860. 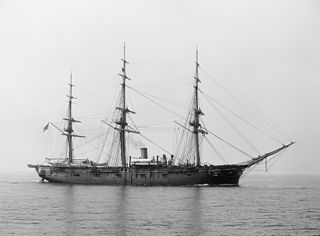 After the outbreak of the American Civil War in April 1861, Vincennes was recommissioned on 29 June and assigned to duty in the Gulf Blockading Squadron. She arrived off Fort Pickens, Florida, on 3 September, and was ordered to assist in the occupation of Head of Passes, Mississippi River, and remain there on blockade duty. Though the Federal warships did successfully deploy, on 12 October 1861 the Confederate metal-sheathed ram Manassas and armed steamers Ivy and James L. Day drove the Union blockaders from Head of Passes in the Battle of the Head of Passes, forcing the Screw sloop-of-war Richmond and Vincennes aground. Vincennes was ordered abandoned and destroyed to prevent her capture, and her engineer set a slow match to the vessel's magazine while her men took refuge on other ships. However, her engineer cut the burning fuse and threw it overboard before the magazine could explode and, after the Confederate vessels withdrew early in the afternoon, Vincennes was refloated. After the Confederate attack, the Union sloop-of-war continued on blockade duty off the Passes of the Mississippi, capturing the blockade-running British bark Empress, aground at North East Pass with a large cargo of coffee on 27 November. On 4 March 1862, she was ordered to proceed to Pensacola, Florida, to relieve Mississippi and spent the next six months shuttling between Pensacola and Mobile, Alabama, performing routine patrol and reconnaissance duty. On 4 October, she was ordered to assume command of the blockade off Ship Island, Mississippi, and to guard the pass out of Mississippi Sound. While so deployed, boat crews from the vessel and Clifton captured the barge H. McGuin in Bay St. Louis, Mississippi, on 18 July 1863. Vincennes also reported the capture of two boats laden with food on 24 December. Vincennes remained off Ship Island for the duration of the war and was laid up in ordinary at the Boston Navy Yard on 28 August 1865. The veteran world traveler was decommissioned in August 1865 and sold at public auction at Boston on 5 October 1867 for approximately $5,000.00, completing a career that made her one of the Navy's most widely traveled ships. ^ Long, David Foster (1988). "Chapter Nine". Gold braid and foreign relations : diplomatic activities of U.S. naval officers, 1798–1883. Annapolis: Naval Institute Press. pp. 207ff. ISBN 978-0-87021-228-4. Retrieved 29 April 2012. Lay summary (February 1990). ^ Charles Samuel Stewart (1832). William Ellis (ed.). A visit to the South Seas, in the U.S. ship Vincennes, during the years 1829 and 1830: with notices of Brazil, Peru, Manilla, the Cape of Good Hope, and St. Helena (Second ed.). Fisher, Son, & Jackson. ^ Dean Boyce, 'The Wolves are at the door: Sydney's century of invasion fears', p. 39. ^ Charles Wilkes. Narrative of the United States exploring expedition, during the years 1838, 1839, 1840, 1841, 1842. 2. Ingram, Cooke, 1852. ^ Van Zandt, Howard (1984). Pioneer American Merchants in Japan. Tuttle Publishing. p. 68-72. ISBN 9994648144. USS Brandywine was a wooden-hulled, three-masted frigate of the United States Navy bearing 44 guns which had the initial task of conveying the Marquis de Lafayette back to France. She was later recommissioned a number of times for service in various theaters, such as in the Mediterranean, in China and in the South Atlantic Ocean. USS Brooklyn (1858) was a sloop-of-war authorized by the U.S. Congress and commissioned in 1859. Brooklyn was active in Caribbean operations until the start of the American Civil War at which time she became an active participant in the Union blockade of the Confederate States of America. The first Vandalia was an 18-gun sloop-of-war in the United States Navy during the Second Seminole War and the American Civil War. She was named for the city of Vandalia, Illinois. The first John Adams was originally built in 1799 as a frigate for the United States Navy, converted to a corvette in 1809, and later converted back to a frigate in 1830. Named for President John Adams, she fought in the Quasi-War, the First and Second Barbary Wars, the War of 1812, the Mexican–American War and the American Civil War. At the end of her career, she participated in the Union blockade of South Carolina's ports. She then participated in a historic raid that Harriet Tubman, the former slave and Union operative, organized with Union colonel Montgomery. 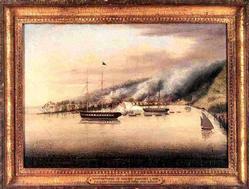 John Adams led three steam-powered gunboats up the Harbor River to Port Royal. The squadron relied on local black mariners to guide it past mines and fortifications. The squadron freed 750+ slaves and unsettled the Confederacy. Tubman was the first woman in U.S. history to plan and execute an armed expedition. USS Saratoga, a sloop-of-war, was the third ship of the United States Navy to be named for the Battle of Saratoga of the American Revolutionary War. Her keel was laid down in the summer of 1841 by the Portsmouth Navy Yard. She was launched on 26 July 1842 and commissioned on 4 January 1843 with Commander Josiah Tattnall in command. USS St. Lawrence was a frigate in the United States Navy that saw service during the mid-19th century, including the American Civil War. She was based on the same plans as USS Brandywine. The first USS Lancaster was a screw sloop-of-war in the United States Navy during the American Civil War through the Spanish–American War. The first USS Supply was a ship-rigged sailing vessel which served as a stores ship in the United States Navy. She saw service in the Mexican–American War and the American Civil War. The first USS Tuscarora was a sloop of war in the United States Navy during the American Civil War. The first USS Iroquois was a sloop of war in the United States Navy during the American Civil War. The second USS Lexington was a sloop in the United States Navy built at the New York Navy Yard in Brooklyn, New York, in 1825; and commissioned on 11 June 1826, Master Commandant William B. Shubrick in command. The first USS Pocahontas, a screw steamer built at Medford, Massachusetts in 1852 as City of Boston, and purchased by the Navy at Boston, Massachusetts on 20 March 1855, was the first United States Navy ship to be named for Pocahontas, the Algonquian wife of Virginia colonist John Rolfe. She was originally commissioned as USS Despatch — the second U.S. Navy ship of that name — on 17 January 1856, with Lieutenant T. M. Crossan in command, and was recommissioned and renamed in 1860, seeing action in the American Civil War. As Pocahontas, one of her junior officers was Alfred Thayer Mahan, who would later achieve international fame as a military writer and theorist of naval power. The first USS Jamestown was a sloop-of-war in the United States Navy during the Mexican–American War and the American Civil War. The East India Squadron, or East Indies Squadron, was a squadron of American ships which existed in the nineteenth century, it focused on protecting American interests in the Far East while the Pacific Squadron concentrated on the western coasts of the Americas and in the South Pacific Ocean. Part of the duties of this squadron was serving with the Yangtze River Patrol in China. The East India Squadron was established in 1835 and existed until it became part of the Asiatic Squadron in 1868. USS Wachusett (1861) – the first U.S. Navy ship to be so named – was a large (1,032-ton) steam sloop-of-war that served the United States Navy during the American Civil War. She was outfitted as a gunboat and used by the Navy as part of the Union blockade of the Confederate States of America. USS Perry (1843) was a brig commissioned by the United States Navy prior to the American Civil War. She was tasked by the Navy for various missions, including those related to diplomatic tensions with Paraguay, the Mexican-American War, the slave trade, and the American Civil War. She was probably named after Commodore Oliver Hazard Perry.